The new monster, Sniper Mk.Ⅰ is here! 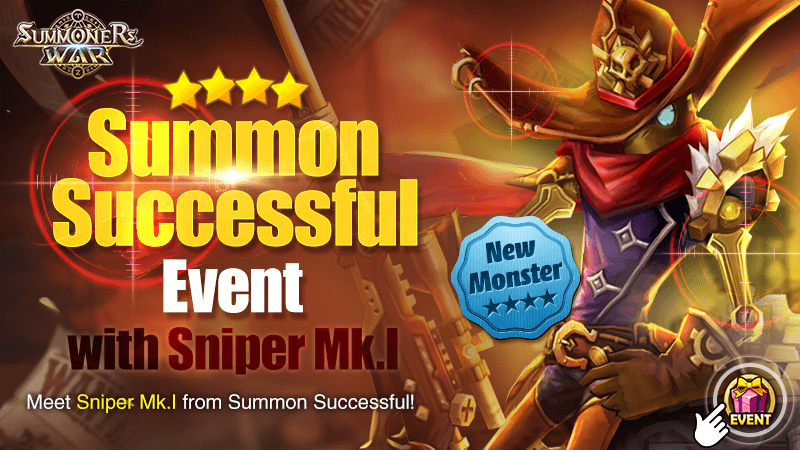 Get various rewards and the new Monster Sniper Mk.Ⅰ when you get "Summon Successful". Get "Summon Successful" and double the excitement! Get various rewards and the new Monster Sniper Mk.Ⅰ! ※ Sniper Mk.Ⅰ Scroll: A random attribute among Fire/Water/Wind will be summoned. * For Summon Successful, only the summonings of default 4★+ Monsters will count. * Summonings performed via Monster Pieces won't count. * Rewards will be sent to your Inbox. * When you use the [Sniper Mk.Ⅰ] Scroll, a random attribute among Fire/Water/Wind will be summoned. * The reward will be available for 24 hours after the event ends. * Please restart the game if you're playing when the event begins to avoid any delays. * Please try restarting the game if you don't see your reward at the Inbox. * The duration and remaining time for the event will be displayed in the time zone of the area that you reside in. l got the water one.